calling me fat, saying I had a booger in my nose, telling me that none of the things I mentioned are happening, and that not being civil equals screaming and/or hate, and that liberalism is the cause. that last point might be worth considering. when people say none of these things are happening, in spite of photos, footage and testimony from the border, it reminds me how important it is to find trustworthy sources of information. I have the New York Times and Washington Post, The Guardian, BBC and Al-Jazeera on my phone. I look for what shows up consistently across those sites. I use them to back up claims that people make on social media. I also trust people to tell their stories, and trust organizers to develop campaigns rooted in transforming real conditions. the main thing I want to expand on is what civil means. the definition of civil is ordinary, courteous and polite. being civil is how we create a sense of normalcy in the world across different cultures and opinions. when we see injustice happening and we remain civil, we are part of normalizing the harm, and we become complicit in things we would never openly claim to be for. disrupting is not acting from hate. in my life the bravery to risk disrupting the norm has always been rooted in a deep love of community, of family, of humanity, of this planet. it is being willing to seek the truth, to speak the facts, to question laws that allow or encourage harm. when those with power are doing inhumane, or anti-planet things, our choice to be disruptive, to be impolite, is one of the ways we wage small resistance that can be become mass resistance and large scale cultural and political transformation. we have learned this from ancestors in our lineages who helped expose and break massive systems like chattel slavery, or holocaust genocide. 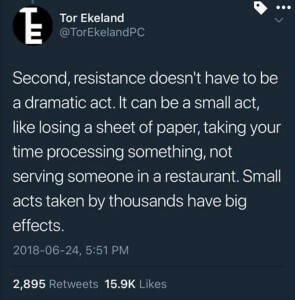 small resistance historically has looked like a wrench in the gears, a slowing things down, a rancid ingredient in master’s food, enslaved people teaching each other to read and write, letting a fugitive sleep in your basement, learning how to give each other reproductive care, slipping each other cannabis for medicine. 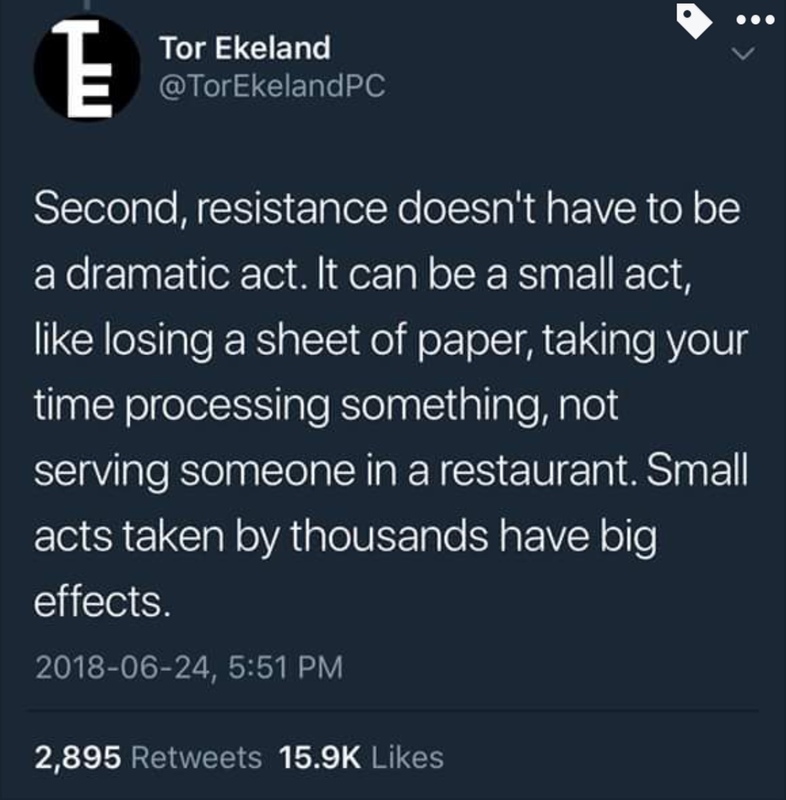 small resistance these days looks like turning people who are supporting and promoting racist, transphobic and inhumane policies away from your door. it looks like stopping next to police cars that have pulled people over and watching or filming them until the person stopped is allowed to leave. it looks like naming -isms and -phobias in real time and learning together. it looks like local direct actions at the homes of congresspeople who make decisions that harm humans or the planet. the forces we are up against are so massive that it can be overwhelming to contemplate getting to freedom, having just governance, feeling something other than shame about the decisions of this country. but each of us has the power every day to disrupt the normalization of violence and othering, to hold out for higher standards of humanity. and sometimes it’s as small as saying no, you shall not sit here and have a normal meal while children scream for their parents as a result of your work. Ok, I think there are ways to be heard without being bullies and down right insulting and belittling to people who have a differing opinion than you. What you’re preaching is mob mentality and anarchy which works on unstable people with violent tendencies. Speak with a voice of reason, rather than intimidation, exaggeration, and trying to shove your beliefs down other people’s throats. I see this on both sides and especially in what you’re saying here. I hear agree with us or we will destroy you, I hear ideas leading to dictatorship…it is not just one sided, you are doing the very thing to people that don’t agree with you as you say you are fighting against. Thank you for this bold & courGeous offering. I’m trying to work through. Being strong & soft. I continue to be encitlrsged by your work as I come across it. Thank you. Disrupting racism and other harmful behavior, rather than going along politely, doesn’t mean being bullies. There is a ton of room in between those two poles. Dictatorship actually comes from being polite while injustice happens. You are missing a sense of scale. Adrienne is against concentration camps, genocide, and harming children. Adrienne recommends filming cops and interrupting politicians’ dinners. Is there some anger you hold inside and are ashamed of, afraid that it puts you on the same moral level as the object of your anger? I know I am a stranger to you, but please consider this question. I ask in the spirit of freedom and healing.